I've been so busy getting our debut book to print, that I've forgotten entirely to write about it. 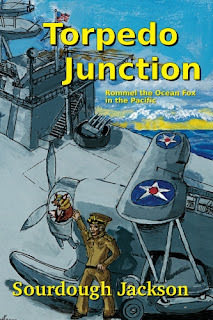 Torpedo Junction is the first novel by Wheat Ridge, Colorado, author Sourdough Jackson, a regular in the metro Denver SF community. It's November, 1941. After only three months as skipper, Commander Anson McDonald is torn away from command of his own destroyer -- a post he earned through years of hard work and better-than-average performance -- to serve in a staff position for a Rear Admiral. McDonald speaks Dutch fluently, and his new boss, a short and feisty Texan, needs that and other skills he knows McDonald has. Enter the boss: Erwin "Tex" Rommel, the Ocean Fox. Rommel got into "aeroplanes" early and is considered America's expert on naval aviation. He has just been given rope to begin carrier operations in the Pacific because "knowledgeable sources" have it from Churchill himself that the Japanese intend to attack Pearl Harbor. Rommel intends to take his rope and lasso the new threat if it turns out to be real. Even if it isn't, he has plenty to do to help break in an assortment of new Dutch ships, including an aircraft carrier, headed for the East Indies. The admiral takes his assignment seriously and begins training Task Force 23 in earnest, getting no end of grief for disrupting the comfortable routines of a peacetime naval base. With the task force assembled, they head to Oahu and destiny; the Battle of Oahu is joined as the ink fades from history books and is replaced with a new story. First as signals officer, and then as chief of staff, McDonald struggles to live up to the demands of command during war, a struggle that allows him to convince himself that he may be "good enough." Within a few months now-Captain McDonald is credited, almost as much as his boss, with living up to their overall mission in the Pacific: "Make the bastards go away." Then the issue is in doubt. Assigned temporarily as chief of staff to Rear Admiral Ray Spruance, McDonald convinces his new boss to take a strategic risk. The result is a terrible beating of the British navy by enemy forces. None other than Admiral Albert Windsor -- Lord York, brother of the King of England -- accuses McDonald of dereliction of duty, and McDonald must argue that he made the right decisions. But he wonders, did he really? Several things about Torpedo Junction endeared itself to me and led me to choose it as our first offering. I'm not much of a fan of military fiction, but this book caught my attention in several ways. It gives a point of view not shared by most military fiction; it shows what goes on at the level of admirals. We come to understand, at least a little, how war is waged by not just a ship, but an entire fleet. I think Jackson chose wisely when making an early change while writing the story. Rommel is the protagonist, but not the point of view character. We see Rommel through the eyes of McDonald. Military aviation is old hat to Rommel, but not McDonald. In this way he is like most of us and we grow along with him. But, McDonald is a seaman as much as Rommel is not. In this way he is different from most of us and we want to understand that difference. We do get to know Rommel in one way other than through McDonald's POV. The real Rommel was known to write to his wife regularly when away, and this Rommel is no different. Interspersed throughout the story are some of those character-revealing letters. Jackson excels in another way. This is a work of alternative history, but it is also a work of diligent historical authenticity. Although it's unusual, this book comes with an annotated bibliography in which the author explains the importance of various books, some scholarly, to the story. Surprise historical figures show up, all in fitting ways. Ensign John Fitgerald Kennedy shows up as an intelligence officer. The real JFK indeed spent his early naval career in intelligence. Edgar Rice Burroughs, the creator of Tarzan and John Carter of Mars, shows up as a war correspondent assigned to Rommel. The real Burroughs was an army war correspondent in WWII, but we learn that Rommel is a fan of Burroughs (and SF generally), and I can easily imagine that Rommel had something to do with the assignment. In this story's logic, just about every departure from our history can be traced back to Rommel. And Rommel the Texan instead of Rommel the German Field Marshal who literally wrote the book on armored warfare can be traced to a fateful decision by Rommel's father regarding a purchase of stock in a Dutch oil company, a decision that wasn't wrong so much as premature, but caused a financial scandal that made the Rommels leave Germany. The story logic is so strong that nearly everything that happens, including how the war in the Pacific unfolds, seems after the fact to have been inevitable. Jackson accomplishes this inevitability without letting the story be predictable. There are plenty of coincidences and lots of historical figures just a little out of place, but not once did I want to say "no, I don't buy it; that's too convenient." I was even willing to buy that McDonald had been an Annapolis classmate of Robert A. Heinlein, who in our timeline was indeed an Annapolis grad and navy man. Oh, lest I forget to mention it, those who know their history will find plenty of little inside jokes. Thoughtful alternative history is more than merely revisionist history. It explores a what-if question. Jackson gives us a more sophisticated what-if question than the surface one: what if Erwin Rommel grew up to be an American rather than a German. I contend the real story question is this: How would World War II have been different if the United States had not been afraid to expose its aircraft carriers to the Japanese Combined Fleet. I think this will be a great read for fans of alternative history, but also for serious WWII buffs. So, Thursday Night Press is proud to announce the immediate availability of its debut novel, Torpedo Junction by Sourdough Jackson. Look for it at Amazon, Barnes and Noble, or your favorite online seller. Independent bookstores can buy from us directly. It is available in trade paper, for the Kindle, and, any day now, the Nook.